Last week we were on vacation in Colorado, and if you’re like me you pick up a magazine or two at the airport for the flight. When we headed back to Chicago on Sunday I bought one of my traveling go-to magazines: Food & Wine. In it was a recipe for ricotta cheese and sour cherry jam tart. I wasn’t into the sour cherry but I did think I could I could easily come up with another flavor, like a lemon ricotta tart for one last bright taste of summer before the leaves start to change. While I got the idea from F&W, I didn’t follow their instructions because I have my mom’s fantastic recipe for sweet pastry dough, a.k.a pâte sucrée. It’s similar to my usual 3-2-1 pie dough but substitutes an egg for most of the water and adds sugar. Initially the dough doesn’t come together as quickly as 3-2-1 pie dough does, it’s much more flaky and crumbly, but after working the butter in and kneading it forms a very nice soft, dough. I really wanted to make the tart burst with lemon flavor so I added lemon extract to the pâte sucrée (instead of vanilla per my mom’s recipe) and loaded up the ricotta with the zest from 2 very large lemons. Those plus the extremely intense lemon marmalade I found in the grocery store give this dessert a power pack of lemon. Not puckering but very very very good sweet lemon flavor! I love the marmalade, in addition to the lemon flavor you get a nice texture from the bits of lemon and candied peel. And the crust made with pâte sucrée definitely has a nice sweetness to it, which is why you’re supposed to use it with sweet/fruit tarts. Look at all the lemon zest in there! The color is mostly from the egg yolks. And yes, those are toothpick holes from checking for doneness. If lemon isn’t your favorite, don’t worry, you can pretty much make whatever flavor you want. Simply change out the jam to whatever you want. Oh and as an added bonus, the dough recipe makes more than you need for the average 9 inch tart pan. Not a whole lot but just enough to make a small galette with any jam or fruit you may have lying about. 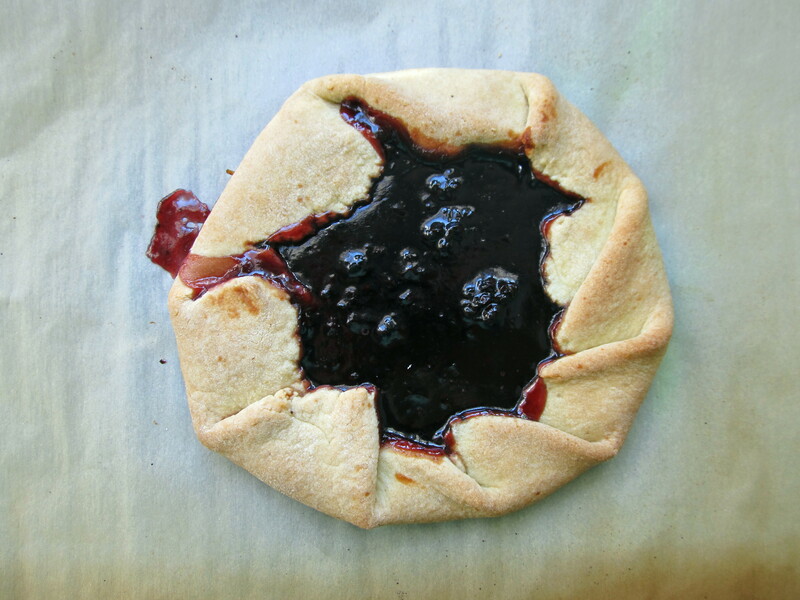 I made a blueberry jam galette and baked it at the same time as the tart, but took it out after about 15 minutes. A nice snack with an afternoon cup of coffee or tea while waiting for the lemon ricotta tart to come out of the oven. A little snack with the leftover dough. Obviously I put too much jam in there. Or can you never have enough jam? Hmmm. In a large bowl, combine all of the ingredients except the butter and mix well with your hands. Slowly add a few pieces of butter at a time and work into the flour with your fingers. When all of the butter has been added remove dough from bowl and knead on the counter or on a cutting board. At first the dough will be a little sticky and won’t appear to want to stick together but after about 5 minutes or so of kneading it will form a smooth ball. Wrap the dough in plastic wrap and refrigerate for at least 30 minutes. Remove dough from refrigerator. On a floured surface using a rolling pin, roll the dough into a large round about 1/8 inch thick. Place the dough into a fluted tart pan and press into the sides. Roll the rolling pin over the rim to trim the excess dough from the edge. Prick the bottom of the dough all over with a fork. Refrigerate for 10 minutes. Cut a piece of parchment paper into a round which will fit on the bottom of the dough. Remove tart shell from refrigerator and place parchment paper and pie weights (dried beans are a good substitute) on top of the dough inside the pan. Bake for 15 minutes. Remove and allow to cool. 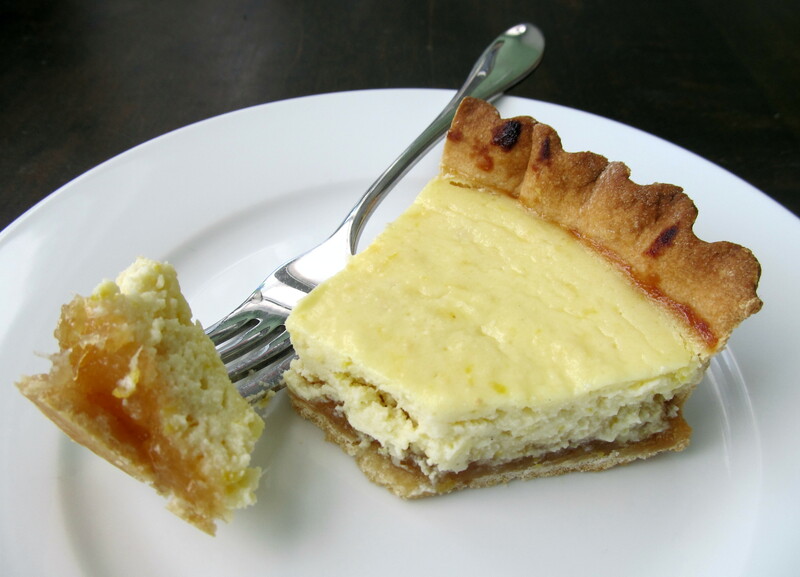 Spoon the lemon marmalade into the cooled tart shell and spread over the bottom in an even layer. Mix the egg, egg yolk, and sugar together in a bowl. When sugar has dissolved fold in and mix the ricotta and lemon zest. Spread ricotta mixture on top of the lemon marmalade. 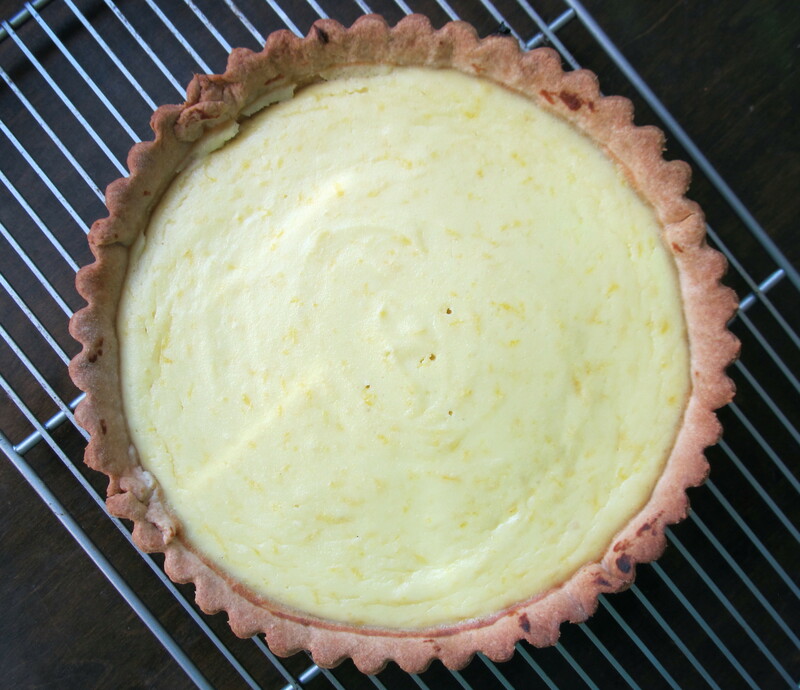 Bake for 45 minutes or until a toothpick stuck in the middle of the tart comes out clean. Place on a cooling rack, cool, then serve. Thanks! It is deeeelicious! And really easy to make. This looks (and sounds) lovely. You’re very talented.